Despite her innovative machinery, the Luna was built as a wood-hulled tug with all of the features typical to Boston Tow Boat tugs. Wooden hulls were preferred because they were cheap, relatively long-lived, and had "give" when bumped and crunched by ships and barges. Riveted iron tugs, on the otherhand, could be dented and leak. The welding of steel hulls was also in the early stages in 1930 when the Luna was built and was not preferred by Boston Tow Boat. The Luna features a one-level pilothouse, side ladderways from the main deck to the boat deck, and two masts that were typical of Boston Tow Boat tugs. The tug was delivered with a white hull, green and brown trim, black rubbing guards, clear varnished deckhouse and pilothouse, and white trim with green upper decks. Fenders were knitted rope at the stem. 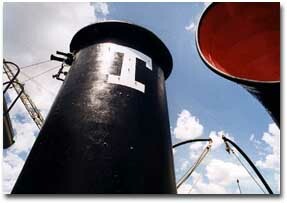 The stack was black with the white "T" of Boston Tow Boat, a carry over from the original company, the T Wharf Towboat Company in downtown Boston. Click for a schematic drawing of the engineroom. Accommodations: 1 master in cabin behind wheelhouse; 2 engineers in stateroom in deckhouse (starboard); 2 mates in stateroom in deckhouse (port); four crew in forecastle on pipeberths. Two Winton Model 130 diesel engines with 6 cylinders, four stroke cycle, 300 rpm, airless (mechanical pressure) fuel injection, approximately 325 hp each, total 650 hp, weighing 21 tons each. One switchboard consisting of a stone slate front dagger switch system with rheostat controls mounted in the aft end of the fidley (upper engineroom). Stations controlled generators, exciters, motor, pumps, lights. All the wood used in the Luna would extend as a one-inch thick, twelve inch wide board for about 15 miles! Hull is substantially crafted from white oak. Frames are on 22-inch centers, created from double sawn futtocks 6 inches thick and 12 inches moulded (depth). Trunnelled together, these frames are 12 inches thick and 12 inches wide. Hull exterior is planked with white oak. Four large broad strakes run from the main deck down. Typical side planking below them is 8" by 3". Keel, deadwood aft, horn timber, and stem frame are built up of heavy white oak, typically 12"x12"
The LUNA has two folding masts. The forward mast carries three "towing lamps": two lit meant the tug was pushing a cargo; three meant it was towing a vessel astern. The original lamps were oil lit and supplied from a locker on the boat deck The aft mast flies the American flag. The galley is located in the forward end of the deckhouse, with oil-fired range and oven and early General Electric refrigerator. A table and seats for five people are forward in the galley. There is no shower on the LUNA! A galvanized iron sheetmetal lifeboat was mounted under davits on the boat deck, on steel gallow frames, over a wood-framed skylight. The base of the davits are on main deck. The tug was heated by an oil-fired furnace on the port side of the engine room, circulating water through a hot water radiator system. A small lazarette for hawser storage was located beneath the aft deck, abaft the engineroom. A small circular manhole permitted lines to be led up and down.